Designing a great customer experience is a little like making a movie. If you want your customer experience to be as engaging for your customers as Avatar was for moviegoers, it all has to make sense. To help you create a cohesive and engaging customer experience, why not do what Hollywood directors do — namely, create a storyboard? A storyboard is an easy-to-understand visual aid that makes it possible to organize, share, and explain your vision. Think of it as a sort of comic-book version of your organization’s customer experience. It tells the entire story, but in bite-sized pieces. Draw a series of rectangles on a piece of paper. Each rectangle represents a different moment in the customer experience. 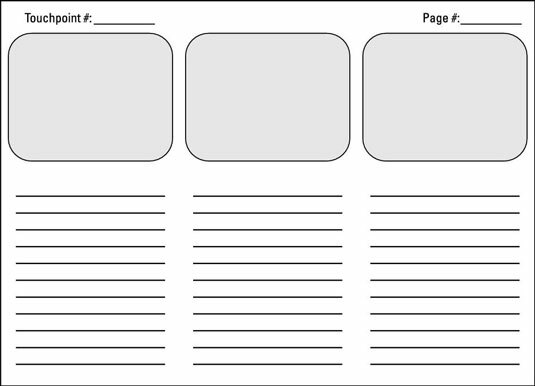 (If you prefer, you can use a storyboard template; loads of these are available online. In each rectangle, draw what will take place in that moment. You can sketch the scenes by hand, draw them using a computer, or even paste in a photo from your phone. Artistry isn’t important; you just want to give a sense of what’s happening. Beneath each rectangle, write down what is happening in that scene. Anyone should be able to read your storyboard like a comic book to get a sense of exactly what will happen in the customer experience you’re planning. This step assumes you have your customer experience intent statement and touchpoint/journey map nailed down. With these resources in hand, look at each touchpoint and determine whether it’s meeting the basic standards set forth in your customer experience intent statement. If you discover touchpoints that are not meeting these standards (and you will), start there. Accomplishment: The need to put one’s abilities to work — to exercise one’s skills, competencies, and talents. Belonging: The need to associate with other people — friends, family, and others — who share the same interest, path, or journey. Order: The need for consistent and logical structure; the ability to control your own experience and predict what will happen next; to have things happen as you expect them to happen. Distraction: The need for entertainment, play, and fun; breaking from your routine and avoiding occasional feelings of being overmanaged, overbooked, and overstressed. Delight: The need for novelty, for interacting with something new. Status: The need for recognition for your efforts, work, commitment, and dedication; being seen as unique. Safety: The need for personal security — avoiding dangerous or compromising situations; feeling no immediate threat from harm, and being able to protect yourself, your loved ones, and your friends from danger. Helpfulness: The need to be of help to others; sharing what you’ve learned, coaching and counseling others who are on the same path, and assisting them with problem-solving. Larry Tesler, a computer scientist and an expert in the field of human-computer interaction, has worked at such companies as Xerox, Apple, Amazon, and Yahoo!, among others. During his career, Tesler developed something he called The Law of Conservation of Complexity. Also known as Tesler’s Law, it suggests that every computer application (extend that to most processes, designs, and interactions) has a certain amount of irreducible complexity. The question is, who will own it? The designer or the user? Put another way, whose time is more important — yours or your customer’s? An organization must view its customers’ time as more important than its own. It must own the complexity. If something you’re working on would be easier for your customer to use if you spent another week or two engineering it, that would be time and money well spent. Otherwise, you’ll wind up creating another customer pain point. To see the negative effects of unnecessary complexity in action, look at the following figure. 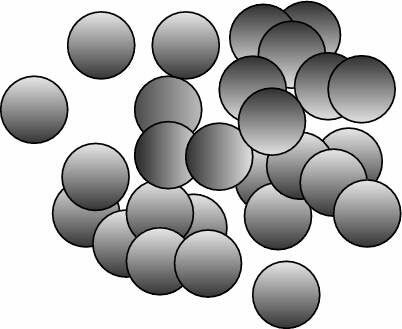 Without using your finger to point, try counting the circles. You can even use a stopwatch to see how long it takes. Pretty painful, huh? 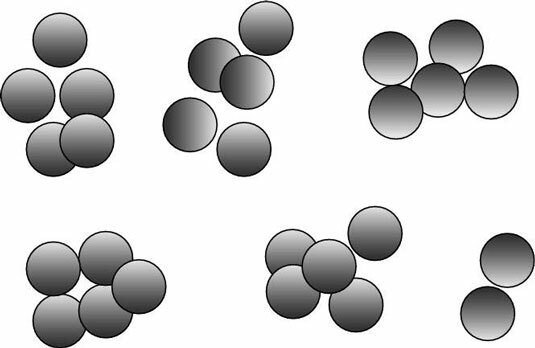 Next, try counting the circles in the next figure, which have been organized into groups. See how much easier it is? If you time yourself, you’ll find you can count these circles way more quickly even though both figures contain the same number of circles! For a real-world example, take a look at the following figure. The image on the left features the operating manual for a Nest smoke detector. As you can see, it’s clean, simple, and easy to understand. The image on the right shows the instructions for a smoke detector offered by a competing brand. Be honest: Which smoke detector would you rather buy, install, and use? The Nest? The bottom line? You want your customer experience to be cognitively congenial — in other words, user-friendly. Credit: Illustrations courtesy of Roy Barnes. Almost nothing that human beings create works perfectly right out of the box. That’s why you must perform usability testing of your customer experience design before you release it into the wild. Turn some users loose on your design and see what happens. Then tweak your design based on their feedback. That being said, don’t go too crazy with testing. Yes, you must do usability testing. But the amount of testing you need to perform depends on the relative risk of customer frustration and failure. If your customer touchpoint involves a nuclear missile launch control, then yes, you should do lots of testing. But if you just want to know how the customer is going to fill out a web form? Perhaps just a touch less.